The inherent problem is that humans cannot be reduced to mere maths equations. We are complex biochemical creatures with everyone having their own unique metabolism and lifestyle. And this individuality then adds a vast amount of variables to the apparently simple two-stage, in/out solution to weight loss. This inadequate equation only offers the beginning and end (calories in and out) of a set of variables that in truth, border on the infinite. It’s like saying that all you need to achieve your car’s recommended miles per gallon is put some in petrol and drive off. Like many things in life today, it’s much more complicated than this. Yet, for all this, the equation is undoubtedly true; like gravity, it’s fundamental principle of the universe that we cannot ignore. However, its use as a weight loss tool to aid in the fight to rid yourself of your unwanted wobbly-bits is at times, pointless. The first missing variable in this incomplete formula is water. It talks about calories and weight but water contains no calories. 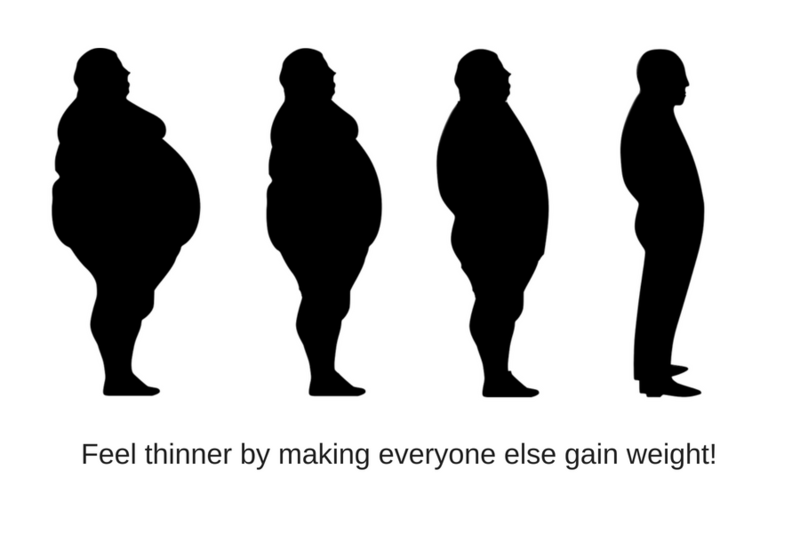 Yet it can make a massive difference – even on a daily basis – to what you weigh. (So possibly you are not overweight after all, just waterlogged!). However, water aside, it would probably help before we dive into the muddy-waters of assessing energy balances, if we explained exactly what a ‘calorie’ actually is. Everyone ‘rabbits on’ about calories. How many in this, how many in that or the other. But what is a calorie – just what are they talking about? It’s very confusing: are there fat calories, thin calories, large or small calories? Do calories hate you; do they lie, using cunning and subterfuge to make you fat? Unfortunately, the answer is slightly dull. In the same way that a ruler measures distance, calories measure energy. In fact, one Calorie is the amount of energy required to raise the temperature of one litre of water by one degree Celsius. Note: One Calorie, with a capital C is equal to one k/cal or one thousand calories (small c). So, a ‘calorie’ is just a man-made term to tell you how much energy is being used to make something hotter. So, if you truly think that calories hate you, then you need more help than we can offer. However, if you think they are lying to you, then you’re not wrong. Let’s see why and look at some of the missing variables in the in/out equation. The calorie values found on food labels are not accurate. In the early twentieth century, American research chemist Wilbur Atwater first determined the energy-per-gram values of proteins (4 k/cals), carbohydrates (4k/cals) and fats (9k/cals). Yet, he admitted that his results were only averages. For example, when testing the same types of apples, he got up to a 20% plus or minus variation. Regardless, the food industry accepted these ‘average’ figures. And now all modern food labelling is a simple matter of multiplying the weight of the ingredients by their relevant ‘average’ calorie values. So, a 500k/cals meal could be as low as 400k/cals or as much as 600k/cals. Although the food may be in your stomach, it doesn’t mean that your body gets to use all of it. In the same way that you have gross pay (before tax, NI, etc.) and net pay (after deductions), you also have gross and net calories. Also, trillions of hungry, intestinal bacteria – vital to aid in digestion – need feeding. They will take an indeterminable amount of calories depending upon which types of bacteria are present in the gut. On an interesting but unrelated note, it appears that bacteria are more intelligent than first thought. Apparently, when food is dropped on the floor, millions of hungry bacteria rush forwards. But the king of the bacteria commands, ‘Stop, you must wait five seconds, that is the law’. You learn something every day! Finally, it takes more energy to digest proteins and vegetables than simple sugars and fats. In the case of protein, your body ‘spends’ as much as thirty calories of energy to process one hundred calories-worth of protein. Whereas simple sugars and fats only cost about five calories per hundred. So, even when your food has been digested the ‘net’ calories in value is still unclear. Well, this is no better. Unfortunately, your metabolism shifts the goalposts when calories drop. It will try and reduce its energy output to match the amount of energy coming in. So, there’s little point in cutting back on 500k/cals per day if you do it in such a way that your metabolic rate reduces by the same amount. Any of the above can cause your metabolism to slow. Add a few of them together and your metabolic rate may drop by up to 40%. That’s possibly 500 k/cals per day fewer than you think you need. So, if you shoehorn in all these variables into the original in/out equation, you’ll see that it’s not so straight-forward after all. So, is the ‘calorie’ irrelevant? Should we just discard it and try something else? What about smaller portions, applying a points system or colour-coding your meals? Well, no, because calories do have an intrinsic worth. Being aware of what you’re eating is a vital weapon in your battle to win the inch war. Therefore, looking at calorie values is an invaluable ally. However, our advice with calories is only use them in terms of comparisons. For example, picking a lower calorie food over a higher one. Or, more importantly, comparing your current calorie intake with what is happening to your body. Starting off with good idea of your calorie intake sets a benchmark from which to base your weight-loss plan. After all, how you can you plan a route to where you want to be if you don’t know where you are now? So, there’s no problem with keeping track of your calorie intake. In fact keeping a food diary is an excellent idea – especially at the start of a diet. But just be be aware that calories are not the ‘be all and end all’ of weight loss. Sadly, over the many years that we have been in the weight-loss industry, we have come across many people with CDO-issues surrounding calorie-counting (Note: CDO is the advanced stage of OCD – it has the letters in the correct alphabetical order!). If you are a regular dieter, we understand this advice likely goes against everything you’ve ever known. However, our advice is that if you rely solely on calories as your only ally in the weight-loss war, you may as well start measuring your waistline with an elastic tape measure.